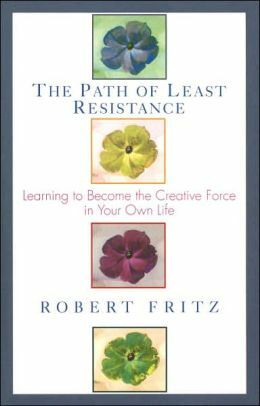 Author Robert Fritz, in his book The Path of Least Resistance, offers what the publisher calls “a revolutionary program for creating anything, from a functional kitchen to a computer program, to a work of art.” Fritz demonstrates that all of us have the innate power to create. Until I read his book I would have seriously doubted this particular claim since I thought creativity was almost always limited to rare individual with unique skills and insights. Fritz believes that we can discover functional steps of creating. (I shared these several days ago.) The important thing is that we see the importance of creating what you truly love and then learn to focus on the creative process. This is what can move us from where we are to where we want to be. This process is not mystical or magical. Using as an analogy the scientific principle that energy follows the path of least resistance, Fritz writes an easily assimilated self-help book which argues that just as wind moves around natural obstructions, seeking the path of least resistance, so we will attempt to move around the various structures of our lives–getting by with as few hassles as possible. Fritz’s overarching advice is to modify these structures, enabling the creative energy within us to flourish instead of dissipate. The focus of his book is clear but, as I’ve indicated, his excess verbiage makes the book rather tedious at points. I found this extremely frustrating so I began to read whole sections quickly grasping his central idea easily without reading all his words. Having said this I found the orientation of this book immensely important for my vision of teaching missional-ecumenism to a new generation of leaders. My dream is to empower younger leaders to pursue a new expression of the church that is nothing short of post-denominational. In light of my experience as a creator I have learned a great deal from Fritz as my posts have indicated this week. One example provides some sense when he writes that “people with strong beliefs in a conceptual framework of reality often interpret reality to fit their biases. Those who have strong political views often interpret reality to reinforce their political explanation of the world” (149). If this is true politically then it is also true religiously. This is why very conservative and very liberal Christians both have a very hard time seeing how things can change in a significant way. They both have a built-in bias about what is “good” and “bad” and who the good guys and bad guys are in a particular situation. This blinds them (me/us) to the other, the person(s) who can make a huge difference in the life system that we call the congregation/church. “When conceptual views of reality bias reality, it is difficult to discover what is going on. Skeptics, fundamentalists, romantics, extremists, racists, idealists, and so on, may misread or misinterpret facts to reinforce their viewpoint of the world. This makes it difficult to include in their perception facts that contradict their theory” (150). When you examine reality with a bias then you generally find what you expect to find and are unable to create anything truly new. How do we avoid this problem, especially inside the church and church-related missions? We must “begin freshly with the notion that [we] know nothing. Separate the ideas you have from your observations. [This is hard work.] It takes practice to put preconceived concepts aside and observe what is truly going on. When you master this practice, you will have a powerful tool you can use to create what matters most to you in life” (151). So how do we do the creative process? You first choose. Once you make a choice for what you want to create then you take two steps. Conceive of the results that you want; i.e., have a clear vision of what you want. Formalize your choice by actually saying the words, “I choose to have . . . .” It is not important that you actually say these words but you should inwardly remind yourself of the point. True leaders can separate primary and secondary choices and keep them rightly ordered. They can also sort through long-term and short-term demands. With all creative people there is one thing that is steady–fundamental choice is the foundation of the entire process. Fritz says that Dr. Martin Luther King, Jr. was a brilliant leader whose skill did not ultimately come from his intelligence. I found this argument rather compelling (208-211). He writes, “It was King’s ability to embody the values he championed that left an ongoing mark on the history of freedom and justice” (209). King preached peace but he also embodied it in his life. He preached understanding but he also embodied it. He mastered what Fritz calls “structural tension” by casting a compelling vision of freedom and justice. “What you assimilate internally tends to be manifested externally. Internal changes often tend to be manifested outwardly. . . .You will not be able to create change in all your external circumstances, but you can certainly create change in your inward realm” (211). It intrigues me profoundly that Robert Fritz ends this study of change, and the power of creation, by retelling the story of the prodigal son from the Bible. His use of this story fits no recognizable exegetical categories I know but it does provide an interesting conclusion to his treatise. He writes: “It is not the prodigal aspects of yourself that deny your full integration, but the part of you that has been responsive, the part of you that has been responsive, the part of you that tried to be a good person [the older brother in the story]” (280). What keeps us from responding to our deepest longings–our “good” or “responsive self” rejects our innately strong longing to be one with ourselves. When you awaken to your deepest longings to be whole you can then find life. Our problem is that we try to be perfect. Christians are, quite often, the worst offenders in this anti-creative life process. Victor Frankl, in his classic book Man’s Search for Meaning, noted that the saints did not reach sainthood by trying to be perfect! If you start with the notion that you have to reach perfection you will be frozen by this desire and never be truly free to live and create. The answer to all of this is what Fritz calls “transcendence” (283-85). It is here that a Christian can find so much to celebrate in this not-so-well written, but deeply intriguing, call to create rather than to simply solve problems. Harry Hooks liked this on Facebook. Itha Tarigan liked this on Facebook.